Decorating Takes (Wicker) Balls, Molly Erdman, Plume. Have you ever flipped through an interior design catalog and asked yourself, “Does anyone really live this way?” If so, “Catalog Living at Its Most Absurd” is for you. An extension Molly Erdman’s popular blog, catalogliving.net, the book gives readers “a glimpse into the exciting world of the people living in your catalogs,” as seen through the eyes of “Gary and Elaine,” a fictional couple who serve as narrators. Way Off the Road—Discovering the Charms of Small-Town America, Bill Geist, Broadway Books. Everything You Wanted to Know About Indians—But Were Afraid to Ask, Anton Treuer, Borealis Books. Rez Life—An Indian’s Journey Through Reservation Life, David Treuer, Atlantic Monthly Press. 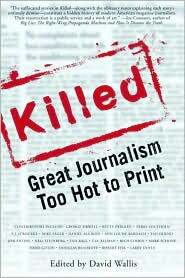 Dead on Arrival—Killed: Great Journalism Too Hot to Print, David Wallis, Nation Books.